lon Musk’s company, SpaceX, revealed the long-anticipated rocket called the Falcon Heavy, announcing that it’s ready for launch. The company revealed the latest photos for people to take a closer look at today’s most powerful rocket in the world, followed by a video on social media network Twitter. The SpaceX Falcon Heavy rocket is preparing to fly for the first time later in January. According to SpaceX, the beastly power of the SpaceX Falcon Heavy consists of 27 first-stage Merlin engines, which givse it three times as many engines as the company’s Falcon 9 rocket, which is a class that delivers Dragon cargo to the International Space Station. 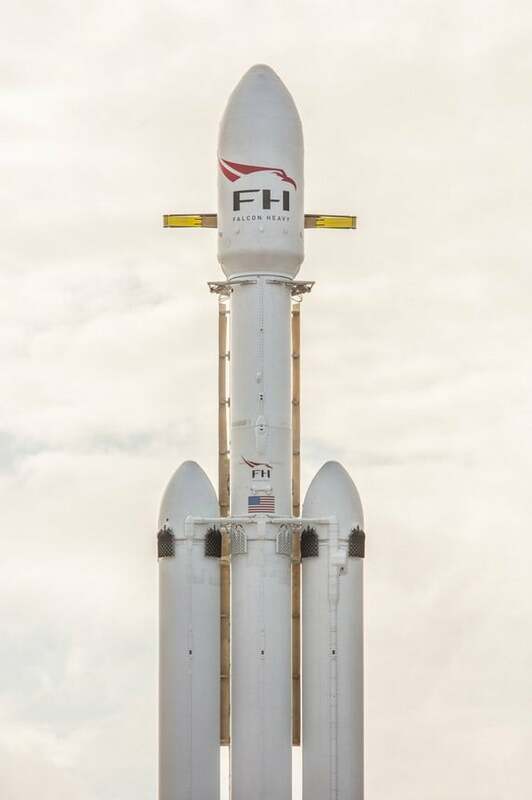 Actually, Falcon Heavy is three Falcon 9 rockets that are combined together. The rocket can transfer a massive payload into space, and its capacity is the largest since the Apollo lunar program’s Saturn V rocket. The SpaceX Falcon Heavy rocket will be set for launching from Pad 39-A at the John F. Kennedy Space Center on Merritt Island, Florida, which is a section of the same area which sent the Apollo missions to the moon. The Kennedy Space Center listed January 2018 as the earliest possible time for launching, although it’s not for certain, as SpaceX is known for delaying its rocket launches. For instance a Falcon 9 Zuma mission which carries a mysterious U.S. Government payload has had months of postponing and is expected to launch on Friday. The first launch of the Falcon Heavy rocket could be risky and there could be a high chance of failure, Musk said at last year’s ISS Research and Development conference in Washington, D.C.
“I hope it makes it far enough away from the pad that it does not cause pad damage. I would consider even that a win, to be honest,” SpaceX SEO Elon Musk said at the conference. SpaceX believes that the rocket will eventually travel to Mars, with a payload of up to 37,040 lbs. Musk recently said that the first passenger to orbit Mars will be his own cherry red Tesla Roadster. Additionally, if you want to book a flight to the Red Planet, you can book a flight for $90m.